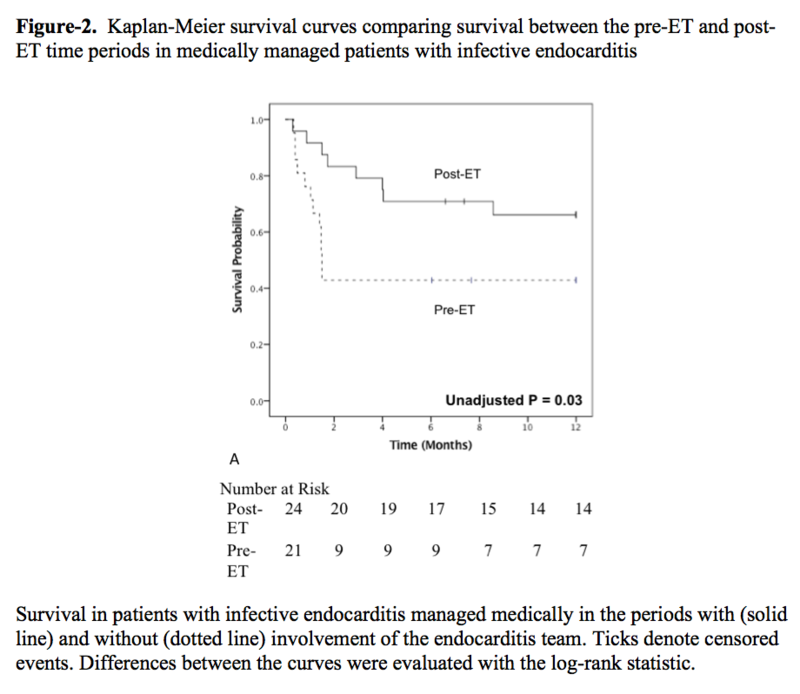 Despite improvements in its management, infective endocarditis (IE) is associated with poor survival. 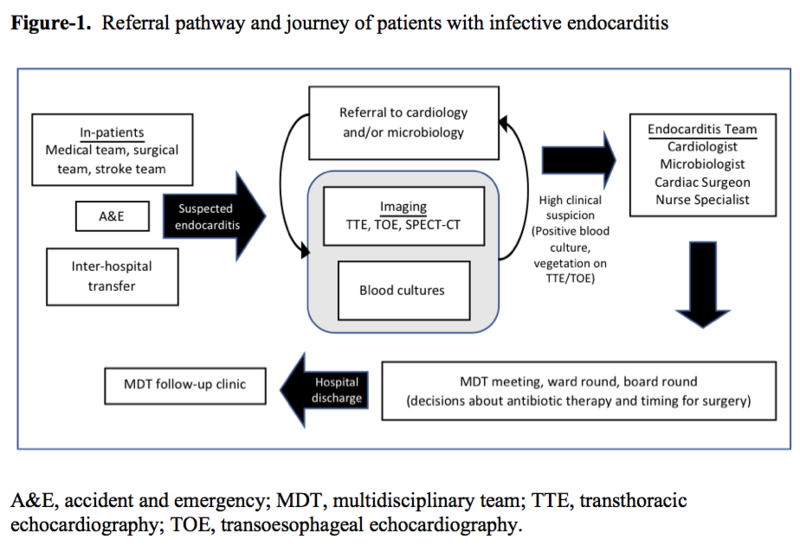 The aim of this study was to evaluate the impact of a multidisciplinary endocarditis team (ET), including a cardiologist, microbiologist and a cardiac surgeon, on the outcome of patients with acute IE according to medical or surgical treatment strategies. We conducted an observational before-after study of 196 consecutive patients with definite IE, who were treated at a tertiary reference centre between 2009 and 2015. The study was divided into 2 periods: period 1, before the formation of the ET (n=101), and period 2, after the formation of the ET (n=95). The role of the ET included regular multidisciplinary team meetings to confirm diagnosis, inform the type and duration of antibiotic therapy and recommend early surgery, when indicated, according to European guidelines (Figure-1). 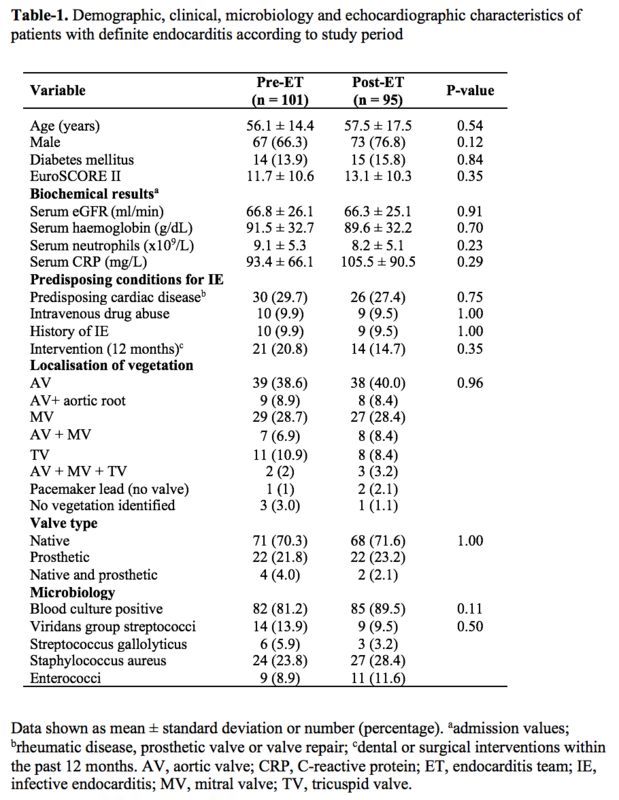 The patient demographics and predisposing conditions for IE were comparable between the two study periods (Table-1). In the time period following the introduction of the ET, there was a reduction in both the time to commencement of IE-specific antibiotic therapy (4.0Ã‚Â±4.0 days vs 2.5Ã‚Â±3.2 days; p=0.004) and the time from suspected IE to surgery (7.8Ã‚Â±7.3 days vs 5.3Ã‚Â±4.2 days; p=0.004). 12-month Kaplan-Meier survival for patients managed medically was 42.9% in the pre-ET period and 66.7% in the post-ET period (p=0.03) (Figure-2). In multivariate Cox regression analysis, the involvement of the ET was a significant independent predictor of 1-year survival in patients managed medically (HR 0.24, 95% CI 0.07-0.87; p=0.03). A standardised multidisciplinary team approach may lead to earlier diagnosis of IE, more appropriate individualised management strategies, expedited surgery, where indicated, and improved survival in those patients chosen for medical management, supporting the recent change in European Society of Cardiology guidelines to recommend the use of a multidisciplinary team in the care of patients with IE.